"Being it is necessary and advisable to perpetuate that which was good in the pioneer homes of our grandmothers; and to preserve their spirit of patriotism and sacrifice; to foster a love for the farm and rural life of today; to uphold the dignity of farming, to teach the responsibility that lies in working the soil; to enhance the charm of a real country home; therefore to create and maintain organized groups to accomplish these ends, we, the Society of Farm Women of Pennsylvania, do associate ourselves together and adopt this constitution"
-Preamble, "Official Bylaws and Constitution," Society of Farm Women, 1951. Color Portrait of Flora Black, 1958. For centuries American farm women had been up before dawn to make breakfast, make the family's clothing, cook, wash, tend the children and kitchen garden, and work in the fields. New technologies, the mechanization of farm work and housework, and the growth of the nation's thriving consumer economy and culture were transforming their lives along with those of other Americans. In the 1900s, too, they also continued to leave the homes of their childhood for new lives in America's towns and cities. Holding onto their belief in the virtues of farm life and rural values, some of these women joined local granges and social clubs to socialize and to promote their vision of America. In the 1910s, Mrs. Flora Black helped found a new social network for women in the Commonwealth. Born Flora Snyder on February 20, 1870 in Somerset, Pennsylvania, as a girl, she did what was expected of her. She helped her mother and learned the skills necessary to be a good wife and mother. After attending schools in Somerset, Snyder went to the Maryland College for Women. After marrying Franklin B. Black in 1893, she applied the knowledge she learned as a youngster to keep their home and raise their four children. Missing the social networks she had experienced in college, Mrs. Black became convinced that farm women should also have time to get together for "fun and learning." 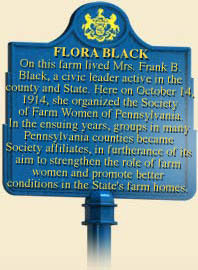 On October 14, 1914, Flora Black and a dozen neighbors founded "Die Hausfrauen," an organization "to contribute to the power and influence of farm women; to contribute to the community activity of farm women; to develop leadership and promote better living and working conditions in the farm homes of Pennsylvania." (The name means "the housewives" in German, and reflected the Pennsylvania German backgrounds of many of the charter members.) As anti-German sentiment grew into a hysteria that swept through the nation during American involvement in World War I, the patriotic founders, in 1917, changed the name of their organization to the "Society of Farm Women." 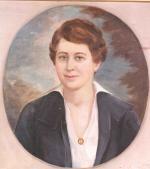 Flora Black served eleven years (1914-1925) as president of the society she founded, and two terms as president of the Somerset County branch (1914-1918 and 1927-1929). Active in the Society until her death in 1951, she was also deeply interested in family and state history, and served on the Pennsylvania Historical Commission in the 1920s and 1930s. In 1998, the Society of Farm Women had 2,772 members in 159 societies throughout the state. Alexander Marshall, "The Days of Auld Lang Syne," Pennsylvania Folklife 13 (1964): 8-19. Joan Jensen, Loosening the Bonds: Mid-Atlantic Farm Women, 1750-1850 (New Haven, CT: Yale University Press), 1986. Society of Farm Women of Pennsylvania, "Official Constitution and By-Laws Society of Farm Women of Pennsylvania," (Harrisburg: 1981).